First of all, you will not prevent a mess starting solids this way, so my title is a big fat lie. Just forget about it. You can, however, diminish it just a little. 1. 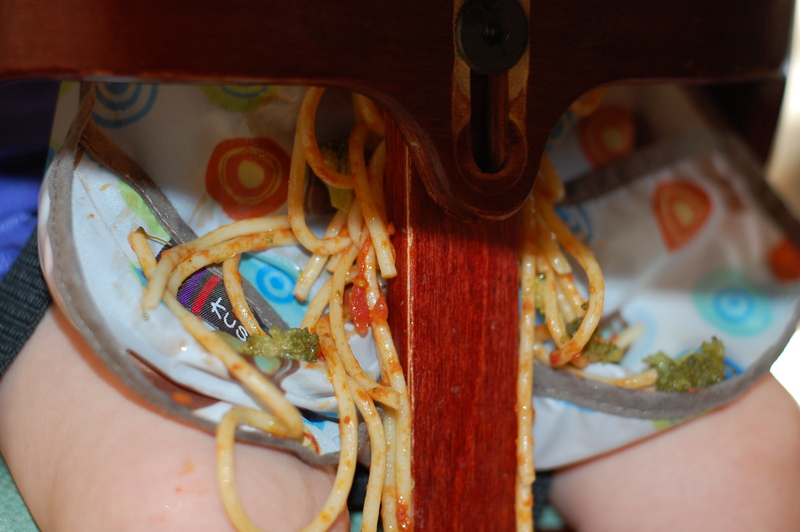 Put an old tablecloth under the highchair. It helps to have more than one. This serves to keep you from mopping up 3 times a day, but it also helps to keep you from wasting every bit of that fresh mozzarella you just paid $8 for. That banished avocado slice shall soon find its way back to have an audience with the princess. 2. Long-sleeve bibs are life savers. In England, apparently, you can find these everywhere and they are made of some type of cloth. They look better than the ones I’ve found online (because I can’t find them in stores). I bought Bumpkins brand and Kushies. Sugarpie is so tiny that the Kushies fits her better right now. I throw them all in the washer and dryer. These are great for the mid-day meals and eating out because Sugarpie doesn’t go straight to the bath. I let her eat a plum with a regular bib and was very tempted to hose her down in the yard. Here’s a link to find them on Amazon. 3. Remove the tray BEFORE you wipe down their hands. 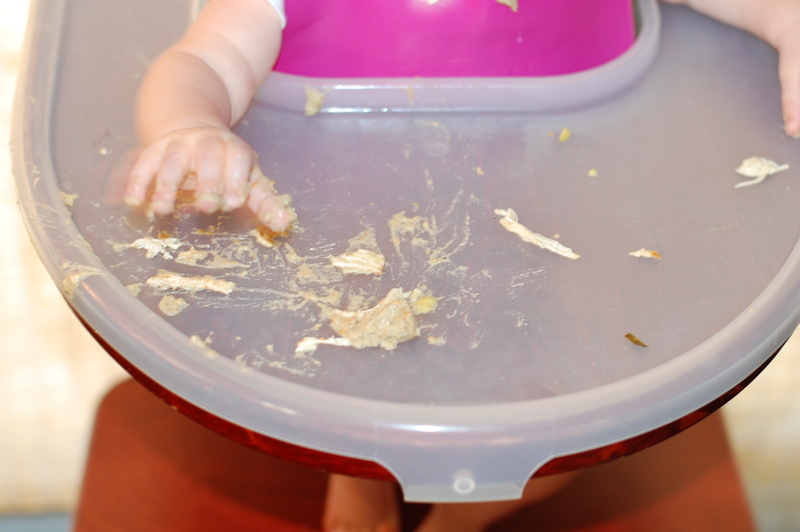 As soon as you clean those tiny fingers, one by one, they are guaranteed to go right back to smearing around the hummus in the 2 seconds it takes you to get the tray unclasped. This is what they like to get their clean hands/arms back into. Also, see why I shoulda used a long-sleeve bib? 4. I bought a cheap pack of thin baby washcloths that I use exclusively for clean up. I start with her face, then her hands, her feet (and sometimes legs). 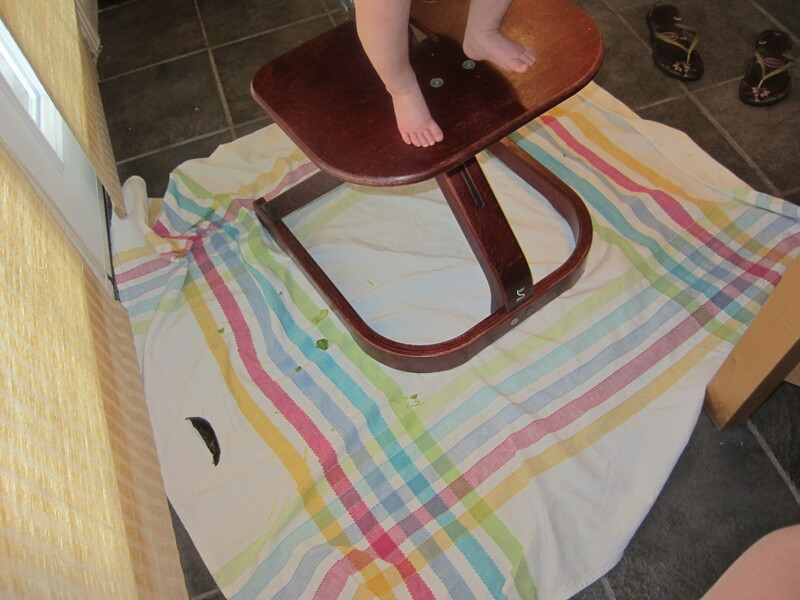 I do a preliminary wipe of the footrest, then I rinse the cloth and wipe the chair once more. It goes into the washer with the rest of the day’s casualties. The alternative here is to get very stressed out about keeping everything clean and preventing messes altogether during mealtime by tying their hands to chair and feeding them yourself. While I’m exaggerating just a tad, I find this not only impractical, but lacking in any kind of fun whatsoever. I want little Georgia to approach food with a spirit of excitement and adventure, just like Mommy and Daddy. So far, so good. Any other tips are welcome! Just leave a comment, I would love to hear it. All good tips! 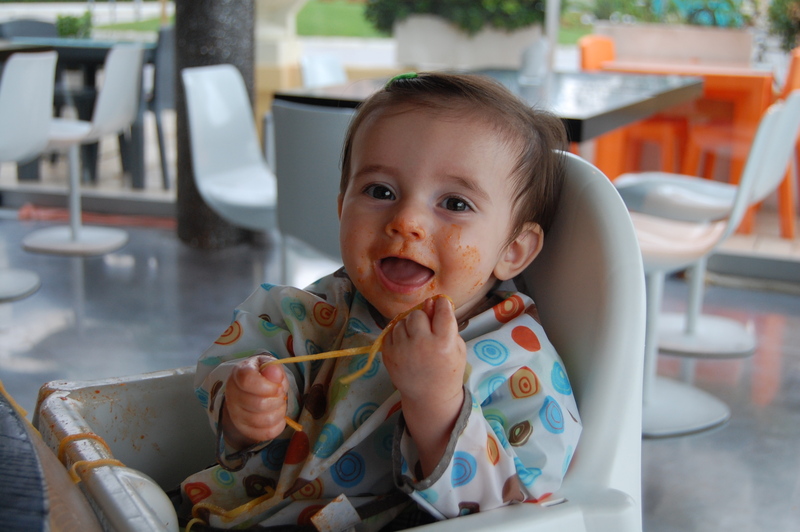 We love Kushies long-sleeved bibs thanks to your recommendation. We even have people stop us in restaurants a lot to ask where to find them. I double-bib at lunch (when I don’t want to have to change her clothes) so that she has her “bib with a trough” (we use this one: http://www.amazon.com/make-day-Silicone-Baby-Pink/dp/B00648KZDY) to catch what she drops during the meal as she likes to “go fishin'” for her scraps at the end of the meal. Great post, Tracie! thanks jacky! i’m glad the bibs are working for you…and thanks for the comment! well hello there, gill! thanks for stopping by! i have so enjoyed this method of starting solids, i think it has really paid off. thanks for writing the book, it really changed the way i think about things and it has just been plain fun 🙂 georgia LOVES to eat and i credit your ideas for cultivating that in her. for any of you reading these comments, gill wrote “Baby Led Weaning, the Essential Guide to Introducing Solid Foods.” i obviously highly recommend it! There is no particular time to start for breast feeding, you can realize it baby’s activity. In these days babies become restless and seem they need feeding more than the normal days. All mothers are advised that instead of increasing number of breast feeding diet you can introduce blend cereal mixed with breast milk for couple of weeks so that your baby will not feel the change in taste. Its best not to offer first spoon feed when baby seems too hungry, develop his habit with spoon slowly.